I found a poster hanging in a small local bistro just over the border in Switzerland, one of my favorite places to eat for lunch. It’s a vintage poster for a French seed nursery in eastern France – but it’s also an historical document of an agricultural calamity. At first glance, it shows a young, robust 19th century woman among grapevines on the southern end of Geneva but on the French side of the border.. But what it is really showing is the effects of the great agricultural, economic and culinary calamity known as the French Wine Blight. Actually, the blight affected all of Europe and the UK, and was apparently due to the introduction of a non-native wine louse, Grape phylloxera into the regions. The phylloxera is a complex little piece of work, with a life cycle encompassing 18 stages in 5 main phases. Very difficult to eradicate, and indeed, there is still no known method to completely rid Europe and the UK of the pest. 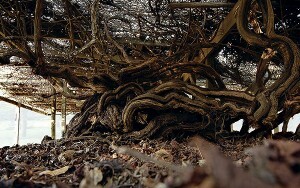 It arrived in the late 1850s, and wiped out an estimated 60-90% of European vineyards over the next couple of decades. One of the challenges was that it took ten years for those studying the problem to be able to locate its origin, namely, the phylloxera that took so many forms. Nothing seemed to work against the pest, until the hybridization technique of grafting European grape varieties on to rootstock imported from the United States was discovered. And thus began the task of reconstituting the wine industry – a process documented in part by the poster I saw in Switzerland. 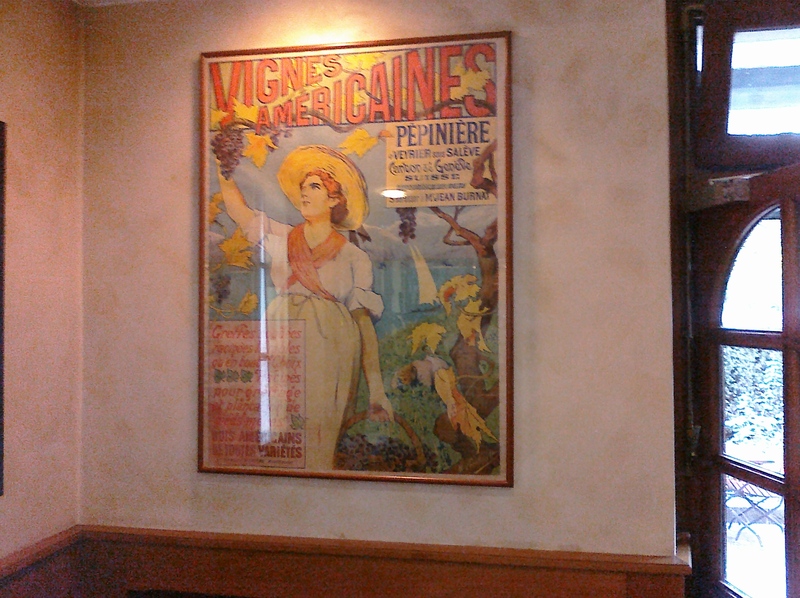 No surprise that this poster was here – Geneva is surrounded by vineyards. I posted recently that the old and very fruitful Muscadet grapevine located in our garden has been one of the few unaffected by a locally occurring pest. We don’t know why, except that we never bring in outside stock, we don’t handle other plants, and our garden is walled. In Europe, there were a few tiny vineyards that remained unaffected by the wine blight. No one knows why. They still produce extremely rare vintages of wine made from pre-blight, ungrafted stock. One of them is a Bollinger Champagne, the Vieilles Vignes Françaises. Another is a port wine in Spain, and a third is a Sangiovese grape in Montalcino, Italy. Did I mention why rootstock from the United States was the preferred import for grafting? 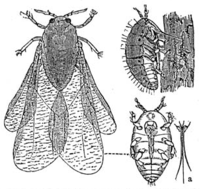 It’s because phylloxera itself is a North American import, brought to the UK and then Europe on hardy American rootstock for planting by horticultural enthusiasts. The American rootstock was, of course, unaffected because it was resistant against the phylloxera. I’ve heard American wine buffs proudly claim that the US saved the French wine industry, but it seems a bit of a stretch since it was our own little pest that ruined it in the first place. It’s a remarkable example of the triumph of non-native species within an entire growing sector.